Good question actually as the so called “military” watch is somewhere between a rainbow and the Holy Grail! Such a maligned term and used as a descriptive on so many watch models that often the models referred to can make me laugh out loud, or make me cry . . . ( don’t you love mixed metaphors!). But seriously what is it that we want from a so called “military” watch? And that’s a problem from the outset – do you consider the actual current Military Specifications (US, UK, Sweden, France, Germany etc.) and bearing in mind they tend to differ. Or perhaps instead you take the all purpose loose term of “Military style” as your guide. Timex Expedition T49976 with NATO. Military look and difficult to beat. Personally I take the latter, as so many of the legitimate “Military Spec” models actually don’t do it for me at all. And that’s mainly because the only important criteria for me when considering a Mil Spec or “military” model is – will it do what I want it to do? – is it reliable, really legible day and night, does it have a conventional strap fitting (if it breaks can I replace it easily), if battery powered – how easy to change, how tough is it in my circumstances, does it have the functions I want or need and is it easy and intuitive to use. And the trouble with the above wish list, which incidentally for me is as good as I need, is that we all want something different because it IS very personal and our circumstances are very different as indeed are our requirements. So a “military STYLE” model is obviously the way to go. I already have a few and as you see not all would meet the true (but variable) Military Specs that are around. But I’ve discounted that anyway in favor of what suits me and perhaps what I consider good enough to be called in my book “Military styled” Or maybe we should forget the military description bit altogether and simply look out for a “suitable for me” watch . . . which fits my lifestyle and seems to make sense. The very affordable Timex Expedition T49976 (which I have had for a while myself) with it’s neat black/green resin shock case is a pretty good example of a “military style” watch that on the face of it, is difficult to beat. 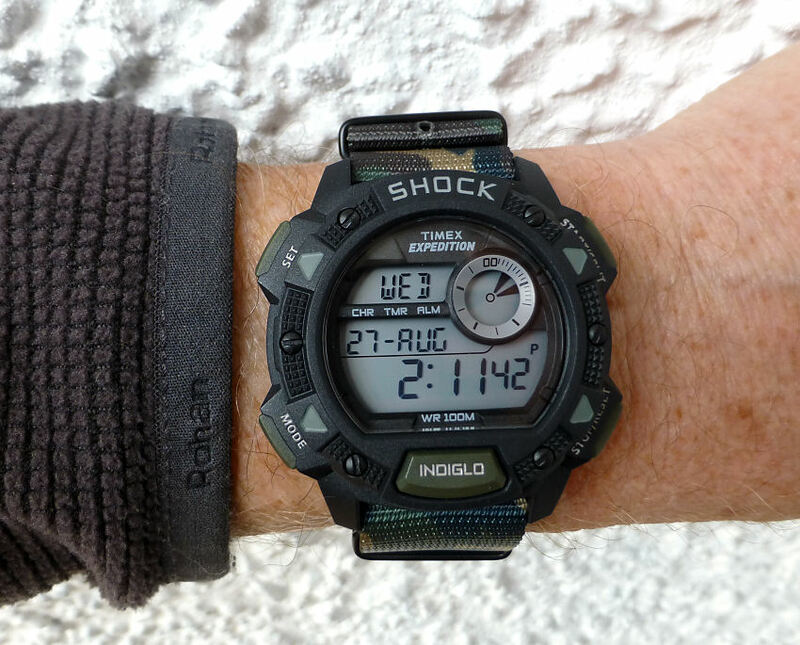 The supplied strap is resin/rubber camo with a non reflective buckle with standard lug fixing – hence the NATO strap fitted here – took about 3 minutes to change it over. This model is digital only, has excellent day and night vision with one of the better incarnations of Timex’s Indiglo, has chrono, alarms, timers and so on and is very easy and intuitive to use. I particularly like the Shock case which on the upper bezel above the glass is a softer compound than the main case, almost rubbery, so top protection is very good indeed. The watch is also a sensible size even though shock protected at just 45mm diameter and if you include the slanted pushers barely 47mm. Lug to lug is commendably short at 48mm, so this watch will fit the smaller wrist without looking like macho man. 14mm depth is also OK and the overall look of the watch is quite unobtrusive with no shiny bits at all. 100m Water Resistance and a CR2016 battery (available almost anywhere) completes the specification and to tell the truth I could stop this Post right now. It’s about as good as it gets at a very affordable price of around £45 in the UK. It works, it’s tough, easy to use, neat, any strap will do and has the no fumble top mount Indiglo pusher for the back light – no searching around with fingertips looking for it or even remembering which pusher it is (unlike many a Casio). So this is my top tip. For further info see my Post HERE. So after mentioning Casio just a second ago, what can they offer? 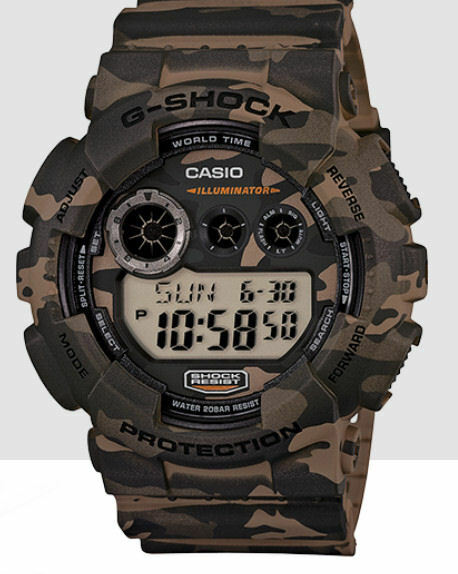 I first looked at a similar “camo” military style model – the Casio GD120CM-5 – a digital only model, which came out earlier this year (2014) which has a similar function set plus World Time. It is a T-Shock model. This Casio also like the Timex has an excellent display with a good standard blue back light for night use and with positive digitals it’s good to see in the day also. A tough case, dull finish, shock resistant, water resistant to 200m and plenty functions from chronograph to Alarms + World Time. It is however considerably larger than the Timex at 51.2mm wide and lug to lug at 55mm and with an unfortunate hefty depth of 17.4mm, this is one big watch. As a digital only military style model priced at $130 or £85 it’s a nice enough watch but certainly not as good value as the Timex (£45) which in my personal opinion is simply better. So overall although it looks the part, in comparison to the Timex it’s overpriced, the strap for me in a problem and the large overall size is not ideal for me. So no cigar! My third pick was gong to be either the gents Nixon Unit SS or the ladies Nixon Unit 40 in black – the only difference being the gents is 44mm diameter and the ladies 40mm, the latter being perhaps the better fit for my small wrist. 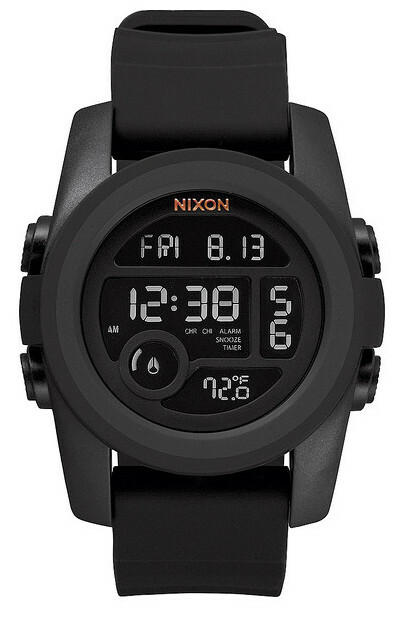 The Nixon Unit 40 – Ladies model! “indestructible polycarbonate case, a positive or negative display segmented dial layout, hardened mineral crystal, good visibility day and night (back lit), 100m Water Resistant with screw case back and a standard silicon style strap with locking polycarbonate buckle. Function wise it features Time and Calendar plus Seconds, 12/24hr selectable, Chronograph, Dual Time, Timer, Hourly Chime and Alarm and nicely sized at 40mm diameter. And the Unit 40 option is under £90 – which is good value”. . . .
– and it looks great and so on – I have one reservation – and that is the legibility or clarity of those digits. I’ve not seen this model “in the flesh” as it were, but looking at the odd review on You Tube, I’d say the clarity of the digits might very well depend on the angle it’s seen from – and that is no use to me. So as often the case I would advise any prospective purchaser to check out “in your hand”. I know the images here look great – BUT so often we’ve been fooled by those enhanced web images. So CHECK IT before you buy. And IF it’s OK, then there’s no doubt this could be a sweet watch – and if really like the image shown here – could easily be a winner. And on the same subject – A friend of mine swears by Suunto brand models and whilst I’m not too familiar with them, I have seen them on occasion in the odd high Street store and had them in my hand and found their readability disappointing and for that reason I won’t include them here. Anyway these are 3 possible “military style” models that might suit and first one, the Timex Expedition T49976 for me is the one to judge all others from. Basically from Price to functions and to practicality and indeed “look” it could be difficult to find anything else that can match up – Mil Spec or not. In my next Post I hope to check out some more “military” look or inspired models that I think might, just might fit my criteria – so as ever – Watch this Space.